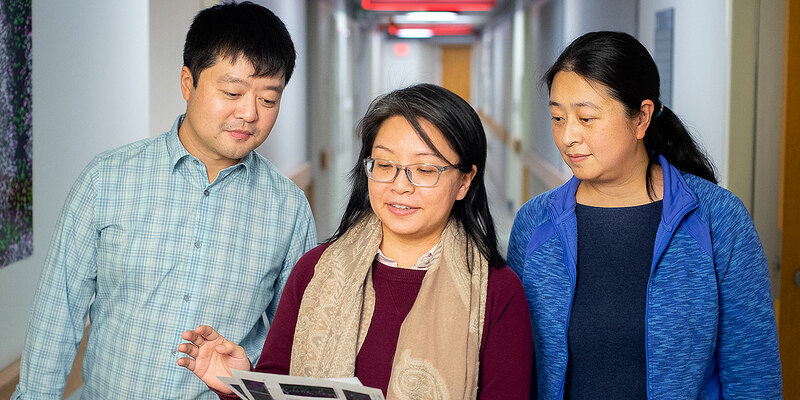 Beisi Xu, PhD, left, of computational biology, worked with Jamy Peng, PhD, center, and Xiaoyang Yang, PhD, to determine that two unlikely molecules work together in brain development. Neural development involves complex biological machinery to take neural stem cells and turn them into neurons and cortex in the brain. Our lab, including colleagues, Xiaoyang Yang, PhD, and Beisi Xu, PhD, used sophisticated technologies of gene editing in human stem cells as well as genomics profiling to find that two proteins link up to regulate a brain development program. Two proteins, UTX and 53BP1, are involved in turning on hundreds of genes. What it means for our research is that we’ve found a new path to map and understand brain development in humans. This cannot be achieved using preclinical models because it does not occur in the models. But first, we didn’t know the two proteins acted together. UTX was originally thought of as a “chromatin modifier,” meaning, UTX alters the structure of the material that makes up chromosomes. UTX opens the chromatin structure to unwrap DNA molecules, allowing their genes to be activated. We also knew that UTX was required for embryonic development of the brain, heart, bone and other organs. We didn’t know how UTX accomplished its tasks. First, we needed to identify UTX’s interaction partners. Using pluripotent stem cells to trace the effects of that interaction on genes known to regulate brain development, we discovered the protein 53BP1 interacted with UTX in stem cells. This was a surprise because 53BP1 is associated with the cell’s ability to repair damaged DNA. We found that 53BP1 and UTX co-regulate a huge array of genes known to be part of the neural development machinery in humans. Specifically, the UTX-53BP1 interaction executes gene expression programs for neural stem cells to differentiate, or transform for specific duties. The experiments with stem cells also revealed that UTX-53BP1 was required for differentiation of the cells into neurons or into brain-like cell structures called cortical organoids. Besides identifying a key control mechanism for neural development, the discovery links the machinery for DNA repair with neural development. What does this mean for disease treatment? Short answer? We’re not sure. But here’s what we do know. We have identified a specific set of targets by these two partners essential for the brain development program — and one of them is crucial for the cell’s DNA damage response. Results from genome sequencing projects show that a group of epigenetic factors, including chromatin modifiers, are often mutated in pediatric cancers and developmental disorders. I want to understand how a network of epigenetic factors influence stem cells and how epigenetic dysfunction leads to stem cell defects in cancer or developmental disorders. The findings also offer a new research pathway to understanding diseases of neural development, such as the rare disorder Kabuki syndrome and pediatric medulloblastoma brain tumors. Kabuki syndrome is so named because patients with the disease have pale skin characteristic of Japanese Kabuki performers. It is known to arise from a defect in the UTX gene. UTX mutations are also highly prevalent in Group 4 medulloblastoma, the most common type. In that cancer, an epigenetic defect prevents neural stem cells from differentiating into mature neurons, and proliferation of those stem cells produces tumors. Further studies will seek to reveal how the UTX-53BP1 partners specifically target the brain development genes and how they activate those genes at specific times to orchestrate neural development. Jamy Peng, PhD, is an assistant faculty member in the department of developmental neurobiology. View full bio.